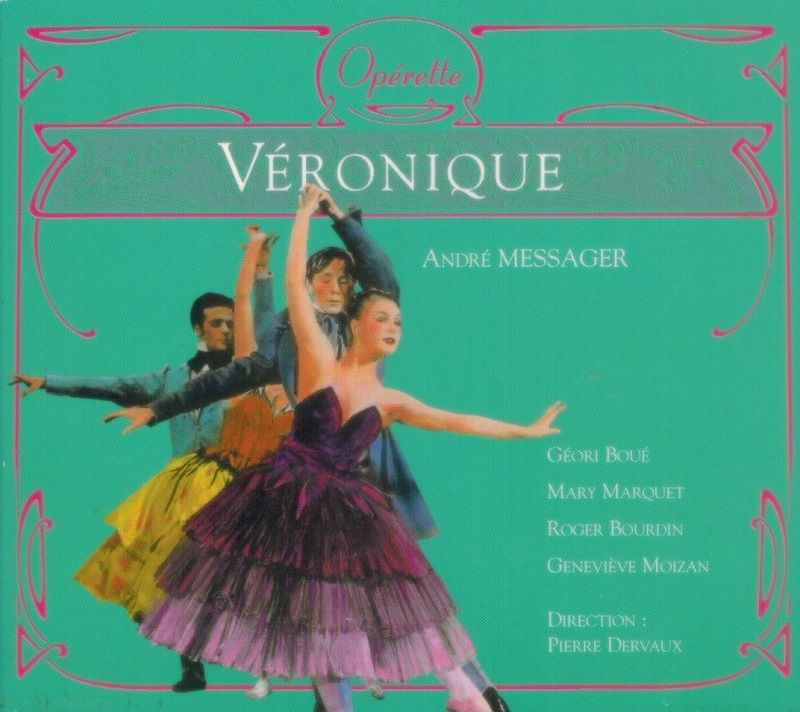 “VÉRONIQUE is an opéra comique or operetta in three acts composed by André Messager. The French libretto was by Georges Duval and Albert Vanloo. 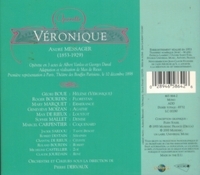 VÉRONIQUE is Messager’s most enduring operatic work and was widely performed in France, London and elsewhere in the fifty years after its premiere. VÉRONIQUE was first performed at Théâtre des Bouffes Parisiens, Paris, on 10 December 1898. 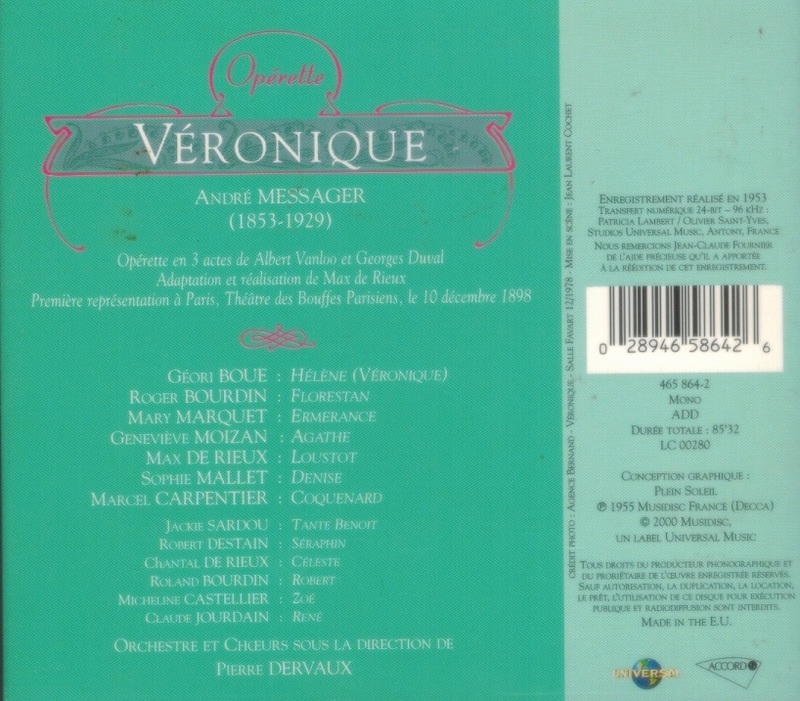 Messager's most successful operetta, it was revived frequently in France during the first part of the 20th century. Revivals played at the Théâtre des Folies-Dramatiques on 30 January 1909, the Théâtre de la Gaîté-Lyrique on 1 March 1920, for which Messager composed a new waltz (with Edmée Favart, Périer and Tarriol-Baugé), and at the Théâtre Mogador on 17 April 1943 (with Suzanne Baugé, Maurice Vidal and Hélene Lavoisier), in a grand production that, according to Richard Traubner, ‘overpowered its fragility’. “Geneviève Moizan entered the Conservatoire de Paris in 1942, and upon graduation in 1946 she won first prize in the Saint Sulpice competition. She débuted at the Paris Opéra in 1949 as Marguérite in FAUST (with Noré and André Pernet), moving on to a vast repertoire. She often appeared in Monte Carlo, Geneva, Strasbourg, Brussels, Algiers, etc. It was, however, her collaboration with the ORTF which gained her the essential part of her national popularity for almost twenty-five years. "Roger Bourdin studied at the Paris Conservatory, where he was a pupil of André Gresse and Jacques Isnardon. He made his professional début at the Opéra-Comique in 1922, as Lescaut in MANON. His début at the Palais Garnier took place in 1942, in Henri Rabaud's MÂROUF, SAVETIER DU CAIRE. The major part of his career was to be spent between these two theatres, where he created some 30 roles. Bourdin seldom performed outside France, but did a few guest appearances at the Royal Opera House in London, La Scala in Milan, and the Teatro Colón in Buenos Aires. He also sang in the first performance of surviving fragments of Chabrier's VAUCOCHARD ET FILS IER on 22 April 1941 at the Salle du Conservatoire with Germaine Cernay, conducted by Roger Désormière.